My time at Banting House National Historic Site as a Research Assistant is coming to a close and I couldn’t have asked for a better experience this year. It’s been an amazing eight months working under the guidance of Grant, the museum curator. I’ve also had the chance to work alongside some of the Canadian Diabetes Association staff and a great group of dedicated volunteers. I learned so much from talking to these people about their past experiences and why they have engaged with everything that Banting House does. Coming into Banting House, most of my experience with museums had been in interpretation – helping visitors understand the significance of a site. I continued to build on these skills by leading tours for visitors in the museum. I was also able to develop new skills through a number of different projects which have given me a much better understanding of how small museums operate. There is more to Banting House than what is on display, and some of the tasks I undertook included writing marketing material for Banting & Friends VII and helping to plan for the World Diabetes Day event. I also learned about cataloging and caring for objects such as Banting’s desk or the wallpaper in Banting’s bedroom. There were a number of challenges this year as I struggled to write the Emergency Preparedness and Response Plan as well as experienced what happens when you find archival material that changes the direction of a project (I don’t think I’ve ever been this invested in a tree before!). Luckily I had great support from Grant which helped me to see these projects through. While these projects could be frustrating at times, they enabled me to try writing formal reports and to work more closely with Banting House’s Commemorative Integrity Statement (CIS). Our classes touched on the theory behind policy documents, but consulting the CIS to complete these reports showed me how policy is applied in practice to promote the core values of a site. I’m lucky to have had the opportunity to get a better understanding of this relationship before heading into the heritage field. So what’s next for me? I’ll be starting an internship at the Oil Museum of Canada in May where I’ll be able to use the skills I’ve learned in my classes and at Banting House. I’ve really connected with the messages that Banting House shares (anyone who’s worked with Grant knows how infectious his enthusiasm can be) and so I’m also transitioning into a volunteer role at the museum where I’ll be helping with tours on weekends this summer. Working as a Research Assistant for Banting House has reinforced that there is so much more to a museum than what visitors see on a tour. Thank you to everyone who helped to make this a fantastic experience that I will carry with me into the future! A group of the volunteers at Banting House NHSC. 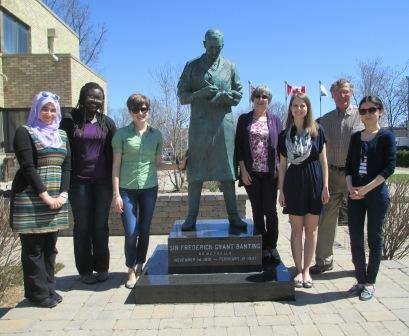 Their dedication to Banting House helped to make my time as a Research Assistant amazing! This post was written by Taryn Dewar, Graduate Research Assistant at Banting House NHSC. Taryn is a Master’s candidate in Public History at Western University. Posted in Uncategorized.Tagged Banting House NHSC, Cataloging, Projects, Volunteers. Next Post What Would You Save in a Fire?